Montana covered by stifling cloud of smoke. The first big fires of 2007 in Idaho blew smoke across uninhabited Central Idaho and into the Bitterroot Valley of Montana on July 9. More and more fires started in Idaho and then throughout western Montana. The fires are of all sizes, but a large number are over 50,000 acres. 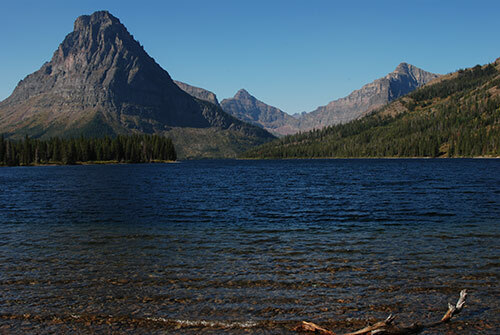 On my trip there last week I couldn’t find clean air anywhere south of Glacier National Park. While only some of the fires were actively burning new territory, diffuse smoke was rising all over the large swaths already inside the fire perimeters. This came from creeping, smoldering, individual trees (such as red lodgepole torching) and few runs. This made for few visible plumes, but omnipresent smoke. I stayed one night at a motel in Hamilton, and I asked the night clerk about it. She said the smoke has been nearly continuous since July 9 (a few clear days). 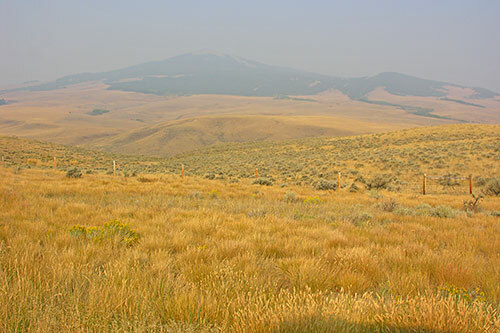 The smoke was hardly confined to the Bitterroot Valley, but filled almost all the Western Montana valleys and well as the mountain air and the plains to the east for a ways. The year 2000 was a huge fire year and 2001 pretty big too. With just a few exceptions, Western Montana has been covered with smoke partially or entirely much of every summer since 2000. This has got to affect recreation and the economy — a dream retirement home in the Big Sky with the sky dirtier than in any city? The fires will return too — not in an unusually wet year, but the trees are so stressed from lack of water and resulting attack by insects and disease, that they are going to burn for a long time in every dry and even normal precipitation year. At Two Medicine Lake. Glacier National Park. Sept. 15, 2007. Smoky Fleecer Mountain, ten miles south of Butte. The way most of Western Montana has looked this summer. Photo by Ralph Maughan. Sept. 16, 2007. 3 Responses to Montana covered by stifling cloud of smoke. Interesting notes. I was out this summer and had to turn around after a couple weeks. The worst place was Glacier, but that was when the fires were raging. I couldn’t even see Sinopah Mountain(the mountain in your Glacier photo) when I pulled into Two Medicine campground due to smoke. I decided to save the money and pull back down U.S. 2 back to the midwest. Sad, but like you say, the air was incredibly smoky, it was very hot and the conditions were poor for camping and photograpy, let alone lung health. It wasn’t as bad in the Gallatin NF around 6,00 feet, but even that got bad eventually and there were evacuations. I am now making plans to visit the nothern Rockies in late May to early July from now on. The rivers are blown out, and fishing won’t be as good, but at least it will be green and the air quality will be healthy. It’s a shame what’s going on and it’s obvious at least to me that climate change is playing a role in these fires, drought and insect infestations. You have been living out there quite some time. Is this the worst you have seen it? I’ve been going out for ten years or so and this year was by far the worst I have seen in terms of drought, heat, smoke and fires. I lived most of my life in Idaho and Utah, except for 4 great years in the Badger State! Forest fires were rare and fairly small until the 1980s when Idaho had its first big forest fire season. There was amazement when that year the Mortar Creek fire burned over 100,000 acres along the Middle Fork of the Salmon River and several other fires burned over 50,000 acres, but it wasn’t until 1988 the the huge fire erupted. That’s the year Yellowstone Park burned (and a lot of public land outside, but adjacent to it). Less told, that year there were large fires in Montana and central Idaho. Montana briefly closed all its national forests to public entry that summer. 1989 was the year the fires started in Western Idaho in the McCall area. Since then the forests have been totally transformed in that general area over several million acres with about 400,000 more this summer! 1994 was a bad fire year in Idaho. My wife worked a fire tower near the Oregon/Idaho border. She had fires on both sides of the tower. I worried. 2000, however, seems to have been the real turning point. Every year was a bad one in a major region of the West, not necessarily Idaho or Montana, but perhaps Oregon and Washington or Arizona and New Mexico or Colorado. These are my brief perceptions. Most of the smoke in western MT, especially from Glacier NP down the Flathead and up the Bitterroot Valleys, has come from Idaho. There’s been some dramatic satellite photos printed in the newspapers showing the plumes (at least one should be found at missoulian.com ). Here in Missoula County, we had some really bad smoke days before there were any fires in the area…it was all from ID and some from WA, I think. Still, there were some local fires that made their own significant smoke contribution. Most recently we’ve been subject to ID smoke. The state of our forests and climate change hint that smokey summers are the norm for our lifetime. Moreover, there is growing understanding that we in the arid mountain west have just seen the end of an unusually wet period (roughly coincident with the white man’s settlement). It seems that the region is returning to its norm which is even more arid than the ‘arid mountain west’ that we know. That kind of drought teamed with increasing temps and changing weather patterns will change the landscape.